Fristbite League winner Ben Heron. Ben Heron of Eye Community Runners winged his way to victory in Sunday’s Frostbite League race at Hinchingbrooke Park in Huntingdon. Eye enjoyed double success with the highly promising Isaac Ellard winning the junior race. Heron was made to work hard for his victory as a large lead group stalked him early on. The 27 year-old eventually moved clear, winning the five-mile race in a time of 28:09. Yaxley’s James Mogridge finished second, 13 seconds behind Heron with James Whitehead of Werrington third. Nene Valley’s Rob Brownlee and Michael Channing both made the top 10, as did Brian Corleys and Phil Martin of Bushfield Joggers. Ramsey Road Runners Lisa Marriott was first lady home in 34:08 with Yaxley’s Caroline Woods not far behind in second place. To add to a good day for the Yaxley ladies Gina Crane came home eighth. Perhaps not surprising given the race venue, Hunts AC were the winning team with Werrington Joggers second. Nene Valley Harriers and a resurgent Yaxley Runners tied for third place. After three of the six races the local challenge is spearheaded by Werrington in second position with Nene Valley third and Yaxley fifth. Ellard was made to fight for his junior race victory, but eventually pulled clear of Hunts AC’s Conall McGinness to win by eight seconds, completing the 2.5km circuit in 8:46. Katie Tasker running for PACTRAC was the highest placed local girl in fifth place. Hunts AC were junior winners with Nene Valley fourth. Overall Nene Valley are fourth with Hunts AC leading the way. An Over 50 team from Nene Valley Harriers acquitted themselves well in the South of England Masters Cross-Country Championships in Oxford on Saturday. Dave Neal was first home for the city club in 16th place, Sean Beard was 28th and Chris Armstrong 42nd. Nene Valley were seventh best team. The South of England Inter-Counties Cross-Country Championships took place at the same venue with several Nene Valley youngsters representing Cambridgeshire. Amber Park led the local contingent home in the girls Under 15 race in 64th place. Katie Tasker and Olivia Mead finished 93rd and 98th respectively helping Cambridgeshire into 13th position. Lottie Hemmings, daughter of Nene Valley legend Lance, is proving to be a chip off the old block. She was second scorer for the county finishing 69th Under 13 girl. Harriet Salisbury was 10 places further back. The Cambridgeshire Under 17 girls took 13th position with Josie Fortune showing well in 59th, five places ahead of Ellie Piccaver. Under 20 Hannah Randle squeezed into the top 50. Ben Roberts was 64th for the Under 15 boys, who were third-placed team. It was a good day for Nene Valley at Lynch Wood in the December round of the Harrier 5km Handicap League. Daniella Kempson of the host club crossed the line first just two seconds clear of Bushfield’s Sarah Williams. Nene Valley’s Bradley Allen was third. 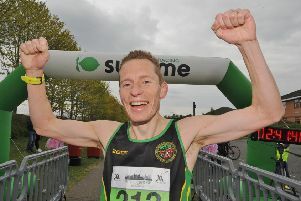 Bushfield Jogger Martin Glendenning leads the series, and a pair of Nene Valley Harriers put in the fastest runs of the season to date. Alex Hampson clocked 16.04 with Ruth Jones setting a new ladies mark of 20:10.